We admit it. CHS was caught a little off guard by the sudden start of activity on the 1818 East Madison mixed-use project. We checked in with the people behind the project to find out more about the conditions in Capitol Hill real estate that have helped re-inspire developers after years of slumber. Here is a glimpse at what changed for 1818 both in terms of the construction plan and the economic conditions that support this kind of project. The exterior and components haven’t changed from the 2007 design (and the image you’ve posted on the blog). Ground floor retail is still part of the plan. The changes that made the project economically feasible were: 1/ changing from a concrete structure to wood framing, and 2/ reducing the number of parking stalls to the minimum number required to meet code. 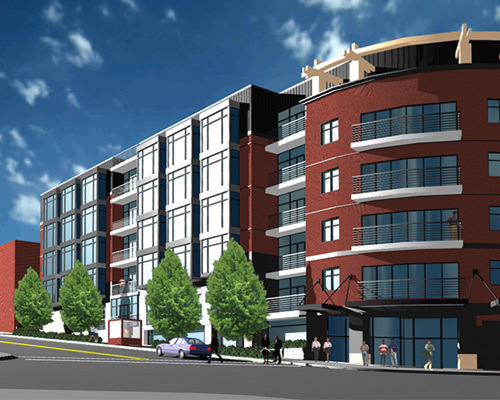 Seattle, Washington – Owner and Developer, 19th & Madison LLC, recently broke ground on the latest loft and mixed-use project in Capitol Hill at 1818 E. Madison. The project is headed by Val Thomas and the general contractor is W. G. Clark.Lorig Management Services has been selected to manage the lease-up and ongoing property management upon completion. The project consists of 131 loft apartments plus 6,600 SF of street level commercial at the corner of 19th and Madison in the exciting area of East Madison. This particular area has seen substantial changes and the addition of this new development will support the vibrancy of the neighborhood. The building will be clad in brick and metal and will have premier finishes for an enhanced living experience. The unit mix will include studio lofts, one and two bedroom lofts, and two story lofts with exterior decks and spectacular views of downtown Seattle. Among many Seattle projects, Val Thomas also designed the condos of the West Queen Anne Elementary project. Sherman said Rolluda is pleased to have the East Madison project moving again. Construction is expected to be completed by early spring 2012. Let’s hope the retail isn’t empty for long when it opens. Is the developer going to try to line anything up so we’re not looking at empty stores? What use would be good there? Wasn’t there a retail study done recently for the TOD on Broadway that shows what residents want and would use?